Citation Information: J Clin Invest. 2018. https://doi.org/10.1172/JCI99308. Citation Information: J Clin Invest. 2018. https://doi.org/10.1172/JCI99888. Citation Information: J Clin Invest. 2018. https://doi.org/10.1172/JCI96209. Induction of TLR2 activation depends on its association with adapter protein MyD88. 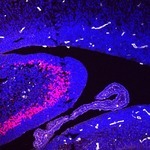 We have found that levels of TLR2 and MyD88 are elevated in the hippocampus and cortex of Alzheimer’s disease (AD) patients and 5XFAD mouse model of AD. Since there is no specific inhibitor of TLR2, to target induced TLR2 from therapeutic angle, we engineered a peptide corresponding to the TLR2-interacting domain of MyD88 (TIDM) that binds to the BB loop of only TLR2, but not other TLRs. Interestingly, wild type (wt) TIDM peptide inhibited microglial activation induced by fibrillar Aβ1-42 and lipoteichoic acid, but not 1-methyl-4-phenylpyridinium, double-stranded RNA, bacterial lipopolysaccharide, flagellin, and CpG DNA. After intranasal administration, wtTIDM peptide reached the hippocampus, reduced hippocampal glial activation, lowered Aβ burden, attenuated neuronal apoptosis, and improved memory and learning in 5XFAD mice. However, wtTIDM peptide was not effective in 5XFAD mice lacking TLR2. In addition to 5XFAD mice, wtTIDM peptide also suppressed the disease process in mice with experimental allergic encephalomyelitis and collagen-induced arthritis. Therefore, selective targeting of activated status of one component of the innate immune system by wtTIDM peptide may be beneficial in AD as well as other disorders in which TLR2-MyD88 signaling plays a role in disease pathogenesis. Citation Information: J Clin Invest. 2018. https://doi.org/10.1172/JCI94351.